This custom printed tape is our best seller and is a strong industrial product. The hot melt adhesive has high initial tack and superior holding power. The benefits of using hot melt tapes are that they provide a strong bond, they seal fast, and they apply quickly to cartons. The adhesion grows over time and is capable of securing heavy loads. Hot melt tapes work best in temperatures ranging from 45 to 120 degrees in Fahrenheit. Packaging tape that is 2.0 mil offers high performance strength for a variety of shipping requirements. These hot melt tapes are made out of BOPP film which have grown to become one of the most popular, high growth films in the world. BOPP film provides a wide array of benefits such as having excellent clarity, good dimensional stability and flatness, provides a good barrier to water vapor, good performance on high speed printing, is resistant to oils and greases, and is also recyclable. With this custom printed tape tape you can be confident that your boxes will stay sealed while advertising your company name as well. Our hot melt packing tape is available in tan, clear, and white colors. The pricing for these products are for a ten case minimum purchase. 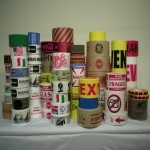 At Custom Printed Tape Supply we offer a wide variety of packaging tapes for many applications.